This entry was posted in Irish theatre and tagged Gerard Sembridge, Peacock Theatre, Shaun Dunne, The Waste Ground Party. Bookmark the permalink. interesting engagement with the play, as was Chris McCornacks detailed review. I saw the play in preview so may have been slightly different and was somewhat underwhelmed. I have to say I’ve never seen the authors previous shows so I am a new viewer of Dunnes work. I think he’s most definitely a talented writer but I also think the play did have serious dramaturgical flaws, well one in particular. You mention loose ends and ‘necessary uncertainty’, certainly you could add Pinter to that list and more recently Crimp is a master at utterly obsfucating an audience. But all these plays grip the audience with the multiplicity and layering of the possibilities of narrative direction and frequently the ‘dramatic action’ is a reversal of perspective to give a reveal of not information but nuance. The same information seen from a different characters angle. I waited all the length of the play for Jasmine Russell’s character (forgive me I don’t have the programme to hand) to become the character that raises my investment in presenting another angle another thread of possibility and it never happened. The issue for me and I think some of my fellow audience members judging by post show comments was that there wasn’t enough ‘necessary uncertainty’. 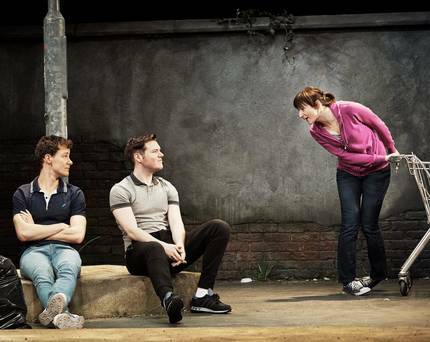 And here I’ll return to Chris McCormacks review referencing Abbey Theatre dramaturgy. There is no Abbey theatre dramaturgy if as he seems to be indicating production dramaturgy of a play should conform to a set model of a well made play along Aristotle’s lines of prescription. Nor should there be. However good dramaturgy supports a playwright to write the best version of the aesthetic they are engaged with. The dramaturgical problem I believe of this play was that it lacked the commitment to uncertainty and potentially non realistic aesthetic as was hinted at in the staging. Thanks Pamela – really interesting comment – thanks for taking the time to respond!